Would you turn up to Sunday League football carrying this? Carrying a briefcase to work is as normal as checking the BlackBerry on the train for the typical commuter, but can we expect the Premier League's finest to carry their boots around in this to training? We brought you the Adidas adiZero F50 miCoach football boots last week, and while tracking your performance at training may seem like a perfectly reasonable thing to do, carting your boots in a briefcase might get a slightly different reaction from your teammates. T3 has managed to get our hands on this specially packed pair of Nike T90 Laser IV football boots currently been worn by Manchester United's Wayne Rooney and Chelsea's Fernando Torres. 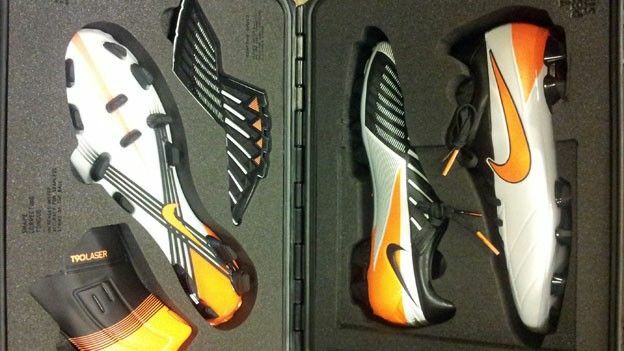 According to the chaps at Nike, the T90 Lasers are made for the 'modern day striker' and to help Rooney and company score those long range screamers the boots are 20% lighter than the the previous T90 boots while key contact zones are broken up with flexible strips to help generate more power behind your shots. Packed inside the heavy duty briefcase alongside the boots is a Shape Correcting Tongue which aims to increase accuracy and an Agility Flex Plate which should reduce slipping because we all know strikers don't want to fluff their lines in front of goal. Whether they are the key to becoming the perfect striker, we are not sure, but it is guaranteed to get you some looks from the opposition. The T90 Laser IV football boots are available to buy now priced at £140.